The truth is that both VPS hosting and cloud hosting are popular today because of the fact that your business can save thousands of dollars by virtualization. Studies reveal that by the end of this decade, nearly $12 billion can be saved simply on energy costs if businesses adopt cloud computing technologies. Energy consumption is likely to be reduced by data centers all across the globe by almost 38%. In 2011, there was a study conducted by WSP Environment and Energy, Accenture and Microsoft. This stated that if businesses could move their data and operations to the cloud, carbon footprint could be reduced by 30% for the bigger firms and by 90% for smaller companies. So, cloud computing is very much here to stay because businesses will get to save much more with virtualization. 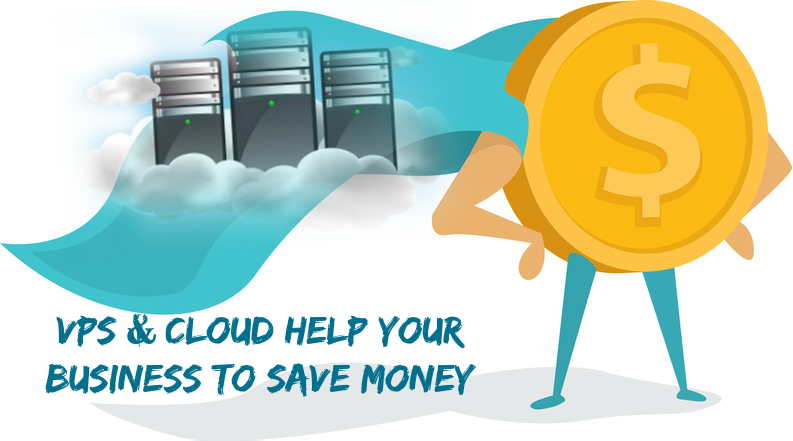 How can the VPS and cloud help your business to save money? • The VPS is really a money saver because it gives virtual private servers which wok like the digital version of physical servers. It has been designed in such a manner that a single physical server will get compartmentalized to create many virtual servers. So, multiple virtual machines will be housed on the same server. So, automatically implementation expenses are cut down. Because of a multi-tenant architecture, VPS plans are much cheaper compared to dedicated server hosting plans. Even from the client side, costs are lower and they get to enjoy almost all advantages of dedicated hosting minus the heavy charges. • Besides cost saving, VPS hosting will help to save resources too. When there are traffic peaks, virtualization is the perfect solution. You can request your web hosting provider or cloud vendor to add more resources like bandwidth or memory to cope with the increase in demands. At the same time, when the demands are low, the need for resources declines and the client can downscale the resources. When the extra resources are taken off, your costs come down once again and you end up saving money. • When you look at disaster recovery solutions for instance, you will find that the cloud or VPS servers are much better equipped to handle these at low costs. Reboot time needed for virtual servers is much less; they can also be restarted through different ways. Moreover, the virtual servers have automatic failover when there are failures. This self-healing is cost-effective and saves time as well. So, whenever there is a crash, the cloud vendor or VPS host will reallocate the site to another hypervisor. This gets reconfigured then within minutes. • Management of virtual servers of cloud servers is easy. In VPS, you get root access; so you can reboot servers or install your own OS and custom applications. You are provided with user-friendly control panels which you may use to install effective security measures for protecting critical data. So, you can save money by deploying robust security measures to ensure data does not get breached and you do not incur loss in revenues as a result. • Since virtual servers are more about software rather than hardware, businesses can save costs. You can modify the virtual servers to carry out a variety of functions. This means you will not have to buy extra hardware and equipments for catering to continuous business demands. Likewise, you can easily modify and upgrade the software to cater to the latest requirements. • Your web host and cloud vendor will take care of the physical servers and if something goes wrong with the virtual servers; they can reboot these right away. Rebooting physical servers takes time and your site may be made to go offline. This can cause significant downtimes and trigger revenue loss. • Finally, with virtual servers, data backups are automated and easy. Dedicated servers in comparison are not completely resilient to failure and corruption. While you will find many backup strategies and solutions for protecting data against loss, virtual servers have the cheapest and the most useful solutions. They can even be programmed with DR solutions. So, downtimes are automatically lesser and chances of data loss fewer. You can save money because you will not have to buy replacement hardware or additional disaster recovery solutions. These are some of the reasons why signing up for VPS plans or cloud hosting is a good way to boost your business continuity and save money at the same time. The VPS plans are highly scalable and with cloud hosting, you can get resources in real time. This is what makes cloud and VPS hosting super convenient especially for smaller and medium sized businesses. How to Keep Online Data Safe from Prying Eyes? How Cloud Server Hosting Can Benefit Start-Ups? Cloud Hosting or Shared Hosting: Which One is better? Cloud, IoT and AI - Shaping the Future of Technology? What Are The Thicks And Thins Of Cloud Server Hosting In Today's Era? Is Cloud Hosting Sounding the Death Knell For PCs? The Internet of Things: a Game Changer?